To roast the broccoli: Heat oven to 425. Place florets on baking sheet. Drizzle with olive oil. Sprinkle red pepper flakes, salt, and freshly ground black pepper over pieces. Sprinkle Parmesan cheese over pieces. Roast for about 25 minutes, until pieces are soft and have that delicious browning on them. Remove from oven and drizzle fresh lemon juice and balsamic vinegar. Set aside. To roast the garlic: Heat oven to 400. Take off the papery outer skin of the garlic bulb. Don’t remove all the skin, just the stuff that comes off easily. The head of garlic should still remain intact. Slice off the pointy end of the bulb to expose all the cloves. Place in a small greased ramekin and cover with the olive oil. Sprinkle just a pinch of salt and cover with aluminum foil. Place in oven and roast for about 45 minutes. The cloves of garlic will be all nice and soft. To caramelize the onions: Place a tablespoon of olive oil in large sauté pan over medium heat. Add the onion slices. Don’t stir too often yet. Let the pieces brown, without getting burnt. After about 15 minutes or so, once slices have mostly browned, I like to turn the heat down to low or medium low. Stir frequently. I like adding a bit of water or oil every so often to keep the pieces from burning or sticking too much. After about 40 minutes or so, the onions should have a dark brown, jam-like quality. To assemble the sandwiches: Place slices of cheddar and Monterey Jack cheeses on slice of bread. Place pieces of roasted broccoli on top, followed by some caramelized onions. Sprinkle Parmesan cheese on top. Spread clove or two of roasted garlic on the top piece of bread. Butter both sides of the sandwich and place on greased griddle. Once one side has turned golden brown, flip and let the other side develop a golden brown color. Once the sandwich has cooled a bit, use the cookie cutter to cut out the whale-shape. We'd also like to take the opportunity to acknowledge our three fellow bloggers who were nice enough to give us our first blogger-to-blogger awards! Averil, from The Cook, The Baker and the Clay Boy Maker, and Dara Reppucci, from Generation Y Foodie, both recently awarded us the Versatile Blogger Award; while Greg, from Crostini and Chianti, awarded us the Liebster Award. Averil's site, The Cook, The Baker and the Clay Boy Maker, is a wonderful new blog sharing great recipes and stories filled with humor and heart. We are drooling over her O is for Oodles of Sesame Noodles and Whiskey Hoisin Meatballs. Dara's site, Gen Y Foodie, has actually been one of our favorites for awhile now. She cooks adventurous, varied, mouth-watering, and healthy dishes, always paired with fantastic photos and entertaining writing! We'd love to make just about everything she posts, but her Shepherd's Pie with Horseradish Cheddar Mashed Potatoes has been particularly on our minds lately. Greg's blog Crostini and Chianti is a great food blog that mostly focuses on Italian food, with occasional forays into other cuisines. His recipes are varied and interesting, and if you haven't seen it, I'd recommend hopping on over. I really like his Irish Dinner Party post from earlier in the year. The mashed potato cakes look so cool! It means so much to us to see support like this from our fellow food bloggers. You guys are awesome, and we look forward to being a part of the community for many years to come! Can't wait to see your next recipes! this grilled cheese looks out of this world! and the whale shape is adorable. How fun that your town has a whale festival. I always love quirky town functions like that. Your sandwich looks like a great homage to the festivities. I never make interesting grilled cheese... you have definitely taken it up a notch. Awwww. Thanks for the shout out! I love you guys too. I also love grilled cheese and whales. Your cookie cutter is so cute I'm already googling to find my own. 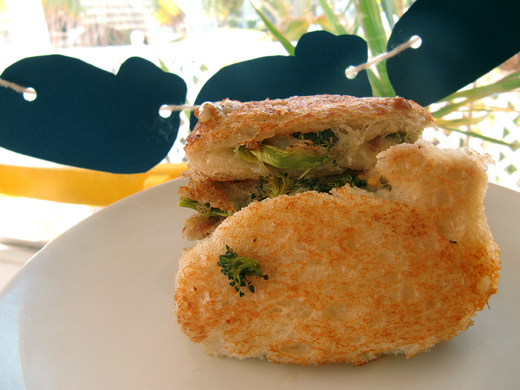 Also: broccoli in a grilled cheese? Genius. okg...drooling here....the ingredients u hav used in this recipe r all my favorites:-) Bookmarked ! I am laughing out loud at the cheesy-whaley goodness! Congrats on the award, too! Congrats on the award! Glad the Festival of whales inspired you to make this awesome toasty sandwich. Love the cheese blend along with the chosen veggies-simply awesome. Have a great evening! Ha-I said awesome twice-I am reviewing my 60th page of blog posts, so I guess it shows in these comments. I buzzed you though! California is such a great place and it's hearing about events like this that remind us how much we miss it, although it's been along time now since we moved. Cute idea for the sandwiches, and we're sure they had a whale of a flavor! That grilled cheese is so cute! I really should cut my sandwiches into shapes more often. It would make lunch more fun. Congrats on all your blog awards!!!! And I'm loving your whale of a grilled cheese :) So cute...and one sandwich I can never resist! Heehee your whale grilled cheese is so cute! And the filling is inspired! I never saw broccoli on grilled cheese. Love it. These look amazing. And, even better, they're in the shape of a whale. Love it! I think I could get my mouth around that sandwich. Just kidding, I totally could. Lol. This is so stinkin' cute! I bet my 2 year old would even love these. Congrats on your awards!